HomeBlog November 2016 DIY Family Room Makeover Collab & $500 Plaid GIVEAWAY! We’ve partnered with the Plaid Creators all year for DIY inspiration, but we’ve never been as excited as we are today to unveil their family room makeover! Keep reading to get the scoop, and enter to win a $500 collection of Plaid arts and crafts supplies AND the entire wall gallery featured here at the end of this post! We knew we wanted to kick off our inaugural year of the Plaid Creators and our 40th anniversary with a special collaboration challenge. The group traveled from all corners of the country to Plaid HQ earlier this year, and while here, they decided to undertake the creation of an entire DIY family room makeover. Individually they all bring their own talent and strengths to the group - but would merging nine different styles really be possible? We’re thrilled to report that despite being hundreds of miles apart and each having their own strong sense of individual style, they dove into the true meaning of ‘collaboration’ and nailed the DIY family room challenge! Armed with Plaid favorites like FolkArt, Bucilla and more, each blogger created one piece of the room and shipped back to Plaid, which we shot on location at Erin Spain’s house. Landing on a palette of greens and blues, each piece of the room decor is not only easy-to-make, but adding DIY accents is an easy way to transform a simple room on a budget. Join us to tour the 2016 Plaid Creators DIY Family Room Makeover! Boring lampshades begone! This little lamp gets its punch from a simple stenciled pattern by Bev at Flamingo Toes - she’ll show you a simple way to stencil a lampshade. Her lamp is perched on our furniture makeover pro Kathy's end table - we’re loving the peek of a stenciled accent on the side of the table! Visit Petticoat Junktion for the full tutorial. The dynamic duo behind the Pretty Life Girls made a snuggly throw blanket (trust us, it’s the kind of soft that makes you never want to leave the couch) and coordinating pillows - if you’ve never stenciled on fabric, Liz and Sam give you the skinny! Erin of Erin Spain used FolkArt Painted Finishes Concrete to make this modern planter - we're a bit obsessed with the peek of gold leaf, too! Plenty of comfy seating is key for any family room and throw pillows are a quick way to add a touch of color. Amy of Positively Splendid is a whiz with painter’s tape, and these geometric accent pillows are an easy place to start if you’re new to DIY. Get handmade help, recipes and more on her blog. The bold gray and white stripes make this storage basket a happy place to land a blanket or extra pillows! Get the how-to by visiting Abbey at The Cards We Drew. One Artsy Mama’s Amy used FolkArt Painted Finishes in Barnwood to get the weathered patina on the planter - follow her for doable advice on home, hand-lettering and more! We’re pretty much in love with the modern, clean lines of Ashley's industrial farmhouse coffee table (with simply genius construction!) - go visit her to get the full coffee table tutorial at Cherished Bliss. And if you’ve never used a woodburner, Katie at Made to be a Momma gives tips and techniques on how to get started in her planter tutorial. It’s an unique way to finish, customize and add texture to inexpensive pieces! The centerpiece of the room is the wall gallery. Wall galleries are an easy way to add both function and personality to a family room. Each Plaid Creator designed a piece of art in the gallery and we couldn’t be more in love with the way it turned out! Be sure to jump to the end of this post for the chance to WIN THE ENTIRE WALL GALLERY - these handcrafted pieces include everything from hand-lettered pieces of art, to beautiful cross-stitch! We hope you love the room as much as we do! Not only was Erin’s own house home base for the photo shoot, she styled the shoot with virtual help from all the other Plaid Creators. Big thanks to Erin for letting us takeover her house for the day! $500 Craft Supplies Collection & Designer Wall Gallery GIVEAWAY! Inspired by this chic family room makeover? 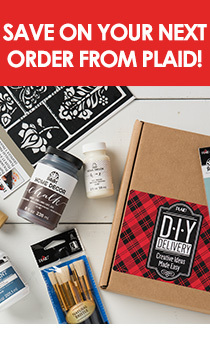 Enter to win your own collection of Plaid arts and crafts supplies to make your own DIY room a reality, PLUS win the entire finished designer art wall gallery designed by all of our Plaid Creators! We’ve made it super easy (and fun!) to enter - visit and follow our Plaid Creators on Instagram or Pinterest using the app below. Get inspired with more from the Plaid Creators, and tag your creations #plaidcrafts to share with us on social!